Ok, let’s be honest, the summer is a busy time of year for everyone. Especially here in Alberta, where it feels like we have to have every weekend planned of our short, short summer season!! It is especially a bumping time for any herbalist who endeavors to grow & make as much of her own medicine as she can. Just choosing 4 herbs I’m working with right now to share with you is only a little slice of the herbaceous pie I’ve got going on! But hey, you’ve got to make hay when the sun shines, as the saying goes. And I like making hay. Between the garden, medicine making, a major renovation project, summer family visits, client protocols, planning herb walks & workshops, harvesting, and working at the Apothecary, I’m one busy bee, but this week I wanted to focus in on a few things to maybe inspire your garden planning, future medicine making, urban harvesting, or to try a herb for yourself! Do you know Linden trees? They are gorgeously in full bloom at the moment. In fact, I went yesterday to my picking spot and found just one tree (mostly on the north side of the tree) that still had blooms that I could pick—the others in full sun were just a bit too past their prime for my liking. The city plants a lot of Linden in public spaces. There are tons lining the streets in Beverly & Beverly Heights. 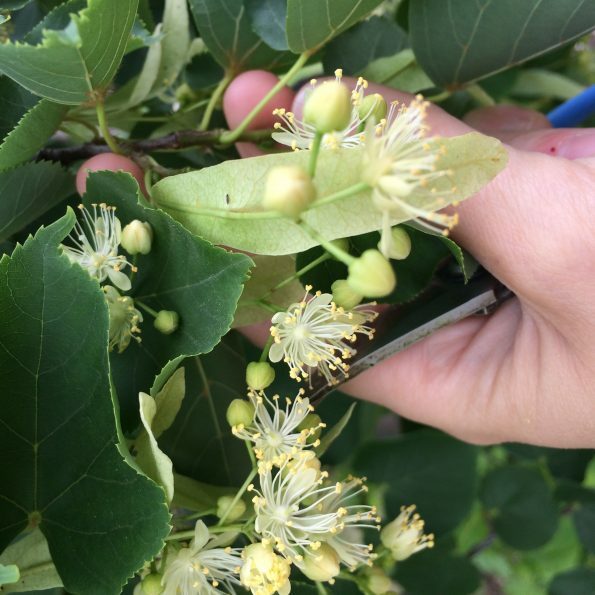 If you are walking down the street or in the park and catch a whiff of something really sweet and fragrant, look up to see if there is a Linden tree nearby. Linden has actions on the nervous system & cardiovascular system. It is calming and often used in formulations for high blood pressure. It has been used for nervousness, anxiety, and is a cooling remedy that has been used in fevers. This is one that I don’t have in my garden, but they are around if you know where to look. Remember to observe good harvesting practices: if it is a public space, make sure it is away from the road/heavy traffic (where exhaust accumulates) & areas that are sprayed. If you have a neighbour that has one, ask if they mind if you harvest some. Use: Dry for tea blends. Can tincture also. Oh, Calendula. This is one plant with so many different constituents and so many different actions on our physiology. Most people learn it as a skin healer, which it is. But it is also so much more! It is also bacterio-static, contains steroidal saponins which affect our hormones, and contains resins which have actions against yeast/fungus. It can help support immunity & has actions on the lymphatic system. And it’s oh-so-easy to grow—the more you harvest, the more it blooms. 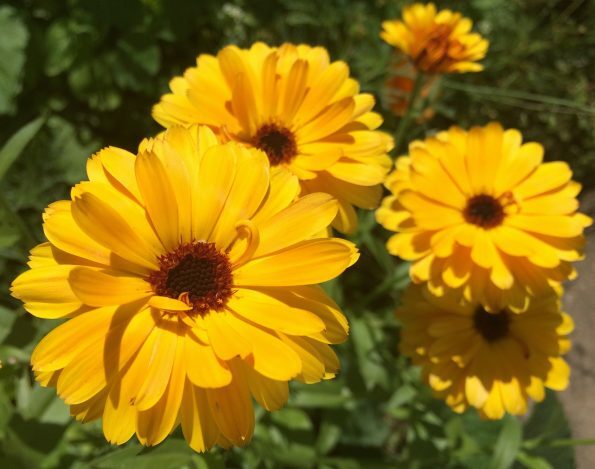 There is a lot we can do with Calendula in terms of using it in teas, tincturing it at different alcohol percentages to work with our desired constituents, and infusing it in oil for salves and creams for cuts and wounds. Plus, they are just plain gorgeous and edible, and so easy to toss on salads for beauty & colour. Traditional Use: Tossed in broths & soups to support winter immunity. Skin healing salves, Teas. See above! Use: Dry for teas or infusing in oil. This is another one I harvest daily from a plant I put in last year. The ones I’ve started from seed still haven’t flowered yet…sigh. But the one plant gives me a pretty steady harvest of blossoms every day or two. And once those others flowers pop open, look out. I’ll be out there every morning with a BIG bowl! Ok, so Red Clover—but you might be thinking: it’s kind of weedy isn’t it?? Well, I guess it depends on the way you look at it. It does pop up as a volunteer in places, which can give it a weedy like quality if you don’t really want it there. As it is in the legume family, it handily fixes nitrogen in the soil. That’s a pretty sweet gift to the garden. 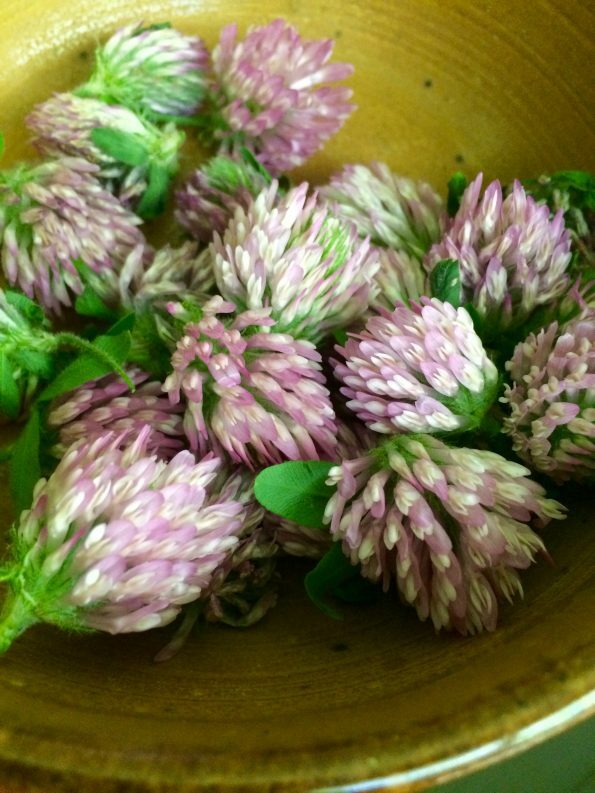 Traditional Uses: Red Clover’s gift to us is that it is an amazing alterative. An alterative is kind of a catch-all way of saying that it supports the body’s eliminative pathways. It is an especially amazing ally for the lymphatic system and has a special affinity for the throat area. It is a great source of phytoestrogens. So I think of it in formulas where there might be immune or lymphatic involvement. This can be anything from swollen lymph or salivary, glands, adenoids, or to where we are getting skin eruptions like eczema or acne. We can also think of it for spasmodic or croupy coughs (it is also expectorant). It is often really helpful in many ways for formulations for women, whether it’s supporting hormones or thyroid or whatever (Whatever= big category. Lol). Very gentle and safe for children. The flowers are very sweet and fragrant—go ahead & toss those on your salad too while you’re at it. 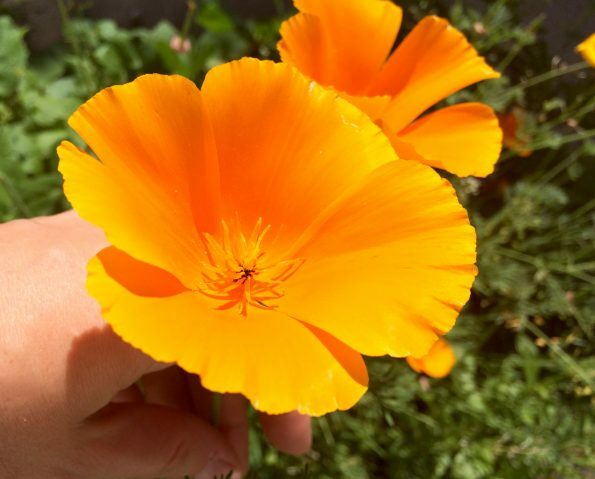 California poppy is another annual flower that is super easy to cultivate and harvest. Easily started from seed, it also easily re-seeds. Popped up where you don’t want it? Just pull it out and make medicine from it. Traditional Uses: To calm over-excitement and to help promote sleep. It is also anti-spasmodic has some actions against pain, so I would consider it in formulas where someone is looking for support for pain and inflammation. How many people need support with sleep and/or pain and inflammation? So many. Use: Can dry the aerial parts for tea, but fresh preparations are best. Fresh tincture is great—you can infuse it in apple cider vinegar as well. I haven’t tried it in a glycerine base yet but I plan to this year. Also traditionally with the little ones. So that’s four of the plants I’m working with at the moment! Stay tuned, there is more to come. And in the meantime if you have a favourite use for any of the plants I featured, or a good experience using one of these herbs, please feel free to share! Previous post: Welcome to yegherbalist.ca! When foraging for herbs in urban areas, select areas that are free of herbicidal and industrial contaminants which can introduce unwanted results in your medicines. After sampling many store bought tinctures I can say that most of them are therapeutically useless – or nearly so. So people use them, don’t get the results, and then conclude herbs just don’t work. So I tell people to “grow the herb yourself, make the medicine yourself from the right part, at the right time with the right stuff and then if it doesn’t work for that condition – it was never meant to treat that condition.” Say, I hear Linden is calming… what would you compare it with.